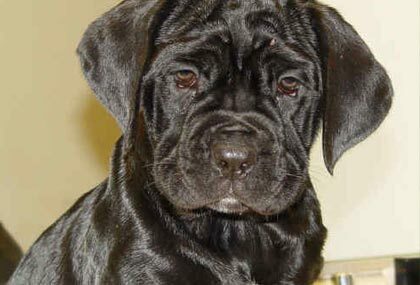 The largest number of puppies ever recorded in a litter was from a Neopolitan Bull Mastiff called Tia, in Manea in Cambridgeshire. Tia gave birth to 24 puppies! That’s a huge amount, considering a normal size litter even for the Neopolitan Bull Mastiff breed is around six to eight puppies. Tia’s owners, Damian Ward and his girlfriend, Anne Kellegher, had thought it would be quite a large litter after their vet did a scan and thought there would be around ten puppies, so imagine their shock when they had twenty four. The bull mastiff grew so large that she could barely move, so the breeders took her to the vet, who decided Tia needed an emergency caesarean. Just two hours later, a record 24 puppies had been born. Unfortunately, four of the puppies were very weak and passed away, however the other twenty were healthy and thriving. 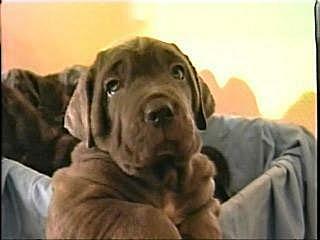 The owners sold 17 of the puppies, each of which was worth more than £900 each. 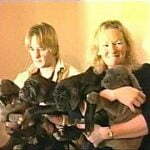 The Guinness Book of Records showed the previous largest litter was 23 puppies, making this litter of Neopolitan Bull Mastiffs a new world record for the most puppies born in a litter and also for the largest number of surviving puppies. The Neopolitan Bull Mastiff is a great breed, but not one for the fainthearted. I have had a dog recentely have puppies, and she had 9, and I thought that was a lot of puppies. Nine is certainly quite a lot! My Jack Russell has just given birth to 8 pups. Does anyone know what the most Jack Russells in a litter is? The dog you show is a neopolitan mastiff not neopolitan bull mastiff as that is not a breed but a mix between a neo and a bullmastiff. Just thought Id mention that my standard size Yorkshire Terrier has just given birth to eight beautiful healthy puppies. We are so proud of her. We was expecting a little of about 2-3 which is the norm for a first litter and were absolutely amazed when she produced eight bonny puppies. They are pure bred yorkies. Polly and my sister’s Yorkie also Standard sized but maybe an inch or small shorter – Monty got together in the New Year! We would love to know what the maximum litter ever produced by a Yorkshire Terrier is? Hi Natalia, that is marvellous. So glad your Yorkie and puppies are all doing fine. Ours are now 6 weeks old and are just about to be weaned. We have been topping up their feeds with Welpi and Lactol as Polly was struggling to cope to all eight. Going to try them with some baby rice this week. If you have any queries or any advice for us even send me a message. Regards, Christine. Sorry, forgot to mention that that was her first litter too! 1st of all…there’s no such thing as a “Neopolitan BullMastiff”…they are simply known as Neopolitan Mastiffs…in show they’re commonly referred to as Neo’s…FYFI!! My Basset Hound recently had 15 puppies. first litter yorkie had 8 pups last night,all doing well,do you know the biggest litter recorded? My great dane had 14! My bull mastiff just had her first litter today and she has had 19 but sadly 2 have passed away. We are unsure if she has anymore. My chow/wolf mix had 3 litters 1st-16 pups 2nd-13 pups 2 died 3rd-11 pups. My Boston Terrier Dazy is about 12-15 lbs and had 11 puppies in her litter WOW!!!!! They were all so cute…. I hav an Akita who gave birth to 14puppies all doin well. My Chocolate Labrador had her first litter and whelped 13 beautiful and healthy pups. They are now 4 weeks old and still thriving. 4 Black and 9 Chocolates 7M/6F. The first was born at 11 minutes to 11pm on 11/11/11 the remaining 12 were born on the 12th. Wow my Miniature Schnauzer had 5 puppies and to think some one had to deal with 20 when I could not even handle a litter of 5 very well. my 2 1/2 yr old pitbull just had 15 puppies on Feb 6th. This was her 1st & only time she will ever have puppies & we thought we would maybe get 6 to 8. It was a shocker when over a 13 hour time period we end up with 15. My Bichon is due to have 8 puppies (confirmed by x-ray) in about 10 days. Normal 4-6 puppies. My Bichon delivered 8 beautiful, healthy babies April 21. All lived. Was wondering what the record is for Bichons. I have heard of another Bichon delivering 7. That´s the biggest litter we ever had. Do somebody know if there were more puppies in a Labrador litter one time? My English Mastiff had 17 puppies two weeks ago! They are all doing well…but mom and I are both tired! My Bichon has just given birth to 9. Several years back I had a Mini Schnauzer that had 11 puppies. 2 didn’t make it – one because it was very small, the other died because the mother didn’t get her out of the sac in time. I had already fallen asleep after 8 were born thinking she was done. But she had 2 more large litters after that. One of 9 pups, the other of 10. My vet said the 11 was unheard of for him. I have a Miniature Poodle Who gave birth to 9 Wonderful Healthy Pups! She has had 2 Litters Prior *First Litter: 8 (3 girls 5 boys) *Second Litter: 8 (3 boys 5 Girls)and Today Had 9!! Never had a Pup die on me! My Yorkie Daisy 3 yrs had her First litter 7 Mo. ago and had 7! (2 girls 5 boys) Mind you she only weighs 4.72 lbs. and none of them Died either. My 8kg has just had 11 puppies all weighing between 3 – 6 kg, only 7 survived ? but she is doing a grand job of caring for them all! My 8 kg is a Jack Russell!! My boston terrier of 9 kgs have 10 puppies. All healthy and natural birth.